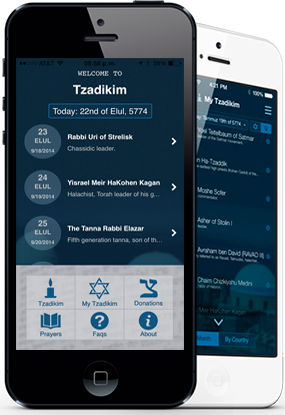 This free app is one of the Daily Zohar projects. It is sponsored by the donations of generous people from around the world. With your support, we hope to bring more excellent apps like this one for free and without advertisements. We invite you to light virtual candles and make connection with the Tzadikim that are close to your heart. Give honor (Kavod) and support to the great souls that existed. Know their Hillula day. (The day they left the physical world). Learn about them, know their burial place, share information and pictures you may have about them, add them to your favorite list and mark the Tzadikim you have visited. Most importantly, by the merit of these great souls, you can ask for assistance in any area of your life to help you achieve your soul's purpose. The picture in the background of the app’s opening screen is of the view of the Sea of Galili (Kineret), looking from the site of Rabbi Meir Baal Haness, ‘the owner and maker of miracles’. It was chosen with the consciousness of bringing miracles to those who pray and study our great Tzadikim.